(Nanowerk News) Gamma rays are the highest-energy form of radioactive waves known in the universe. However, how they’re made and where they come from have been a bit of a mystery. But now a team of researchers, led by Michigan State University astronomer Laura Chomiuk, has made a discovery that may shed some light on the subject. 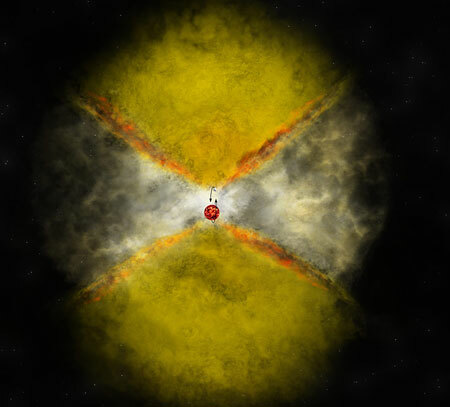 Using highly detailed radio telescope images, Chomiuk and her team have pinpointed the location where an explosion on the surface of a star, known as a nova, emitted gamma rays. This, said Chomiuk, is something they did not expect to encounter. The research is detailed in the current issue of Nature ("Binary orbits as the driver of γ-ray emission and mass ejection in classical novae"). A nova occurs in a star that is part of a binary system – two stars orbiting one another. One star, known as a dense white dwarf, steals matter from the other and the interaction triggers a thermonuclear explosion that flings debris into space. It was from this explosion from a system known as V959 Mon, located some 5,000 light years from Earth, that the researchers think the gamma rays were emitted. This activity was first detected two years ago by NASA’s Fermi Gamma-ray Space Telescope. Also about that same time similar activity was being picked up by land-based radio telescopes around the world. Since that initial detection by Fermi, which occurred in2012, the spacecraft has detected gamma rays from three additional nova explosions in other star systems. Because the type of ejection detected in V959 Mon also is seen in other binary star systems, the new insights might help astronomers understand how those systems develop. “We may be able to use novae as a ‘testbed’ for improving our understanding of this critical stage of binary evolution,” Chomiuk said. Gamma rays can be dangerous and are capable of killing living cells. The medical field uses gamma rays, along with X-rays and other forms of high-energy radiation, to treat cancer. Fortunately, by the time gamma rays travel across the universe to us, they are absorbed by the Earth’s atmosphere.